In my previous post I explained how to create a custom page for your Wordpress Blog. Now I will explain how to set that page as your front page. I will explain two possibilities of custom pages. One is to create your own HTML page in a HTML editor and upload it to your FTP. And the other is to set a blog page as frot page. In this case instead of showing your posts as front page you will see a static page. Now let’s see the two possibilities in detail. Using your favorite HTML editor, create your own page and save it as “index.html”. Then upload it to your root folder, for example “yourdomain.com”. It doesn’t matter if wordpress is installed in the same folder. All internet browsers will interpret the index.html as the front page of your site. Then go to “settings -> general” in your wordpress dashboard. There set your desired Blog Address. For example if you want your blog to display in “yourdomain.com/blog” then set that as url. Again, it doesn’t matter if wordpress is installed at “yourdomain.com”. Remember to have a link in your custom front page that goes to your blog. This option is great for those who want to have their blogs separated from their main sites. That is it. Now let’s see the second option. Sometimes you want to display a static page as your blog home. In this case you will have your posts and articles in a secondary page. This is very easy to set thanks to the new Wordpress features. The first step is to create the static page you want to display, you must do this in the Pages settings. In this example I will name it “Page 1”. Then you must create a second page, but this time you will leave it blank. In this post I will explain how to create a custom page for your blog and in my next article I will show you how to create a custom and static front page. Many site owners want to have a custom template for a specific page. Or set a custom “contact us” page with an online form without having to install a plugin. The first step is to design your customized page in your favorite HTML editor. You can use dreamweaver, fronpage or download a free HTML editor. You don’t have to know HTML programming. 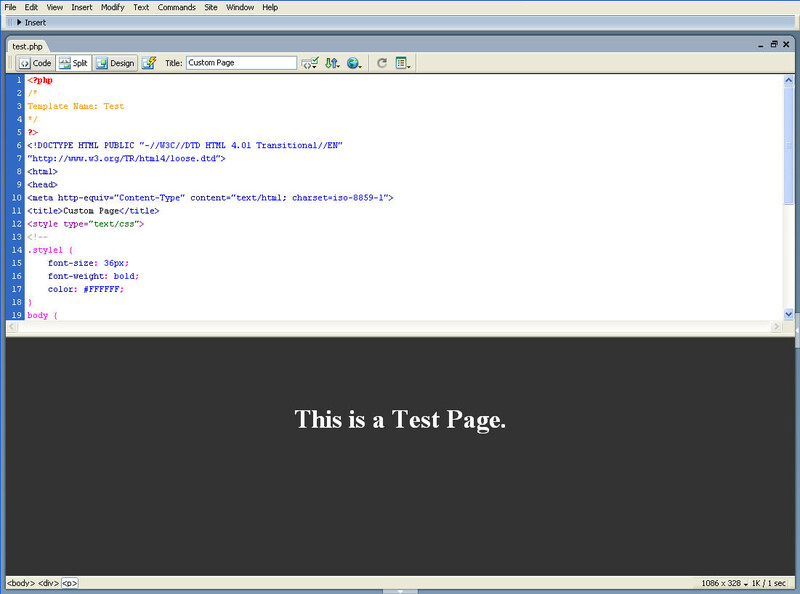 Just build the page in the design view of your HTML editor and then save it as PHP. Your HTML code goes here.